Your Tiny House may be the most valuable asset you own in your life. Protection for it may very well be second most important. After all, weather damage, fires, and theft are all real world situations and although tiny houses on wheels can run, they can’t always hide. 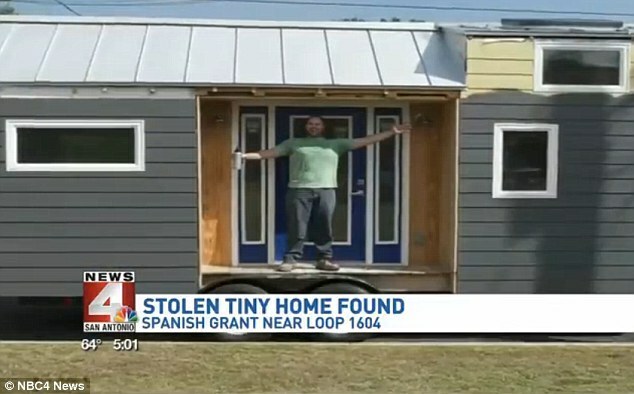 and Casey Friday, whose tiny home was stolen and pawned. While no one relishes being an example of the unfortunate, there were things we all took away from it. That is the beauty of the Tiny House community. Remember when everyone came together to crowdfund Kim Langston’s rebuild after her tiny house was caught in a barn fire? or when Tiny House 43 restored what they could from the ash covered sheathing? Or when news was shared of Casey’s quest to get justice from the thieves and reunite with his long lost tiny home? We watched, were moved to help and encourage until all those challenges were overcome. The harder the struggle, the sweeter it was to celebrate their victory! And we all learned what NOT to do. While some factors we can control (parking farther from adjacent buildings, taking the time to properly dispose of hazardous materials, or buying hitch and wheel locks). Some, we simply can not. Insurance for Tiny Houses under all unique circumstances, settled in one place or rolling along a highway, is non-existent. However,there are efforts in progress and it is a great opportunity for insurance agents to hop on board the Tiny house market. #1 – No matter what insurance you pursue,work with an insurance agent to work through the loopholes. It will also help other tiny home owners in the future by being able to recommend them to an agent that has already written an accepted coverage. #2 Look for a reputable insurance agent already exploring the Tiny House insurance market. Darrell Granz Insurance finalized a deal that will allow them to offer tiny home coverage in all US states (except Alaska & Hawaii), not just the West Coast states they currently serve. Even better, they will have coverage for transporting your tiny home and the unique solutions. Archambault Insurance, CT, used by Runaway Shanty Tiny House. Insurance Resource Center,Neil Gritz, Fairfield, IA, used by Aleks Lisefski. Foremost Insurance (related to State Farm Insurance), only rumored to be able to insure tiny houses since they cover mobile homes, boats, etc. Where there’s a will, there is always a way. Don’t let a gap in insurance discourage you to build tiny. BIG things are happening! This entry was posted in Tiny House Research by Erin Harmon. Bookmark the permalink. Erin Harmon Vazquez is a Tiny House enthusiast, Family Education Specialist, Steeped Tea consultant, Guitarist & vocalist in a local Americana band,CartWheel, and Social Media Maven for Tiny Home Builders. She resides in Connecticut with her husband and four year old son, where they are in the planning stages of building a Tiny House as transitional living to a mortgage-free foundation home. I got a quote from an insurance agency in San Antonio, TX, and had an insurance policy ready to go within about 30 minutes of starting my search for insurance. The only catch was that the house needed to be finished before starting the policy (which is why it wouldn’t have helped in the theft, since it wasn’t finished yet). I got the quote through Access Insurance in San Antonio, and told them exactly what the house was, and they still said they’d insure it. It probably just takes a bit more looking than most people are up to. Casey Friday! Thanks for sharing. I ran into the same thing BUT I found out that I could get construction insurance while I complete my tiny house construction. That being said, I strapped it to the concrete foundation and now have it insured while I finish my build. For the amount of coverage I needed, it ran me just under $600 for the year and I will have enough to rebuild if the anything happens plus peace of mind when the weather gets bad! Thanks for the tip. Perhaps they changed their policy, but just called them and they said they do not cover Tiny Houses. I am now a retired insurance agent of 7 years. While I was active I never ran into, much less had heard of tiny houses. I have insured homemade trailers (not that extravagant, but none the less insured them), builders risk and all other matters that may apply in these situations. Bigger insurance agencies frankly, probably don’t care if they can find you coverage or not. Personal lines seemingly don’t matter to them at all in many cases, IMHO. What I recommend you look for is an agent that represents a smaller state cooperative insurance company. In NY State, North Country Insurance Company is one who comes to mind. They are smaller and much more willing to explore things at a ground level. And they provide coverages that would be applicable to any such endeavor. This would include fire insurance for the builder’s risk policies while it is in construction, mobile homeowners coverages for a moveable structure and for the permanent varieties, regular homeowners policy. Even if only what is known as an HO1 with a substantial deductible. Update that as soon as completed to a 3 or at least a #2. While you are asking, try to find homeowners coverages, whether mobile or not that will include the phrase “Permission Granted To Complete”. This will take over the builders risk, which is designed for construction purposes. Insurance companies may do this if completion is contemplated within a relatively quick timeframe. Try to have a very nearby garage where any tools and supplies can be locked up at night to control theft possibilities. It also looks better for underwriting purposes as well. It may help you find more markets or even any coverage at all, if you can show that you are trying to control losses. And theft may be something you have to self insure anyway. While we are talking, understand that a HO policy will also give you personal liability in case someone gets hurt in use of the premises. Whatever form of coverage you get, be sure the company will cover the liability as well. It’s not just property coverage you want and need. There may be an extra endorsement needed to contemplate the additional exposure, certainly on fire coverages and possibly on a HO accommodation. Also understand that anyone working for you on the project should be covered by Workers Compensation. If not, you run the risk of their becoming the new owner of the home you have just built. Yes, it is that serious. NY Penalties USED to be $250 a day you ran without it that you should have carried it, PLUS reimbursement of any injuries and lost wages. While I don’t know what the penalties are now, I am comfortable to assure you that they haven’t gone down. If you hire a contractor for any portion of the job, you can request a certificate of insurance from them. We used to issue them EVERY day. It is not a big deal… If they make it one, they don’t have insurance. A call o the issuing office to verify a certificate i is a fair precaution as well if you get one that looks photocopied. Being photocopied means it wasn’t issued specifically TO you. A shortcut that busy contractors take regularly. It can be well-meaning, but pretty worthless to you. When you find that agent that will go out of their way to help you, keep them! It is getting harder and harder to find good service from one that cares about YOU any more. And believe me. They have made a few calls on your behalf to help you already.! As a tongue in cheek disclaimer: It just doesn’t seem as hard to find as this article would point out, but again, I never had to find coverage and insurance companies certainly can be a pain in the hindquarters.